Support the green efforts of the Banana and buy a cute tank. I visited 34th Street's Banana Republic today looking for ec0-friendly clothing; WWD wrote of a 50-piece collection to be released on April 8. For now, it's more like a 2-piece collection. There are organic cotton tank tops for women ($18) and shirts for men. The tanks are soft and I love the cut. 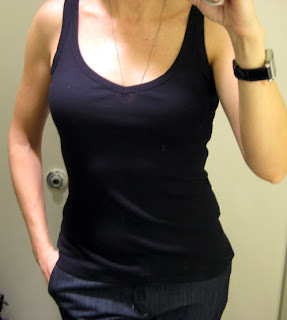 Nothing like classing up the wife-beater with a rounded V-neck. 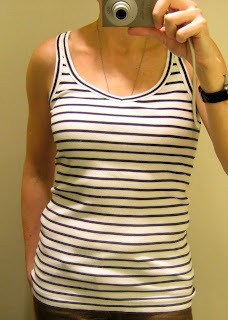 The black is a medium (fit snugly) and the striped a large (long). The other 48 pieces? No worries, as it seems more will be arriving by summer 08. And good news is this will be a continuing concept, not just a flash in the eco-friendly pan. So as it gets warmer look for the green elephant logo (above) to buy organic. It makes me so happy to see the Banana get back to its safari roots. women's jeans: there's always a cute pair on sale (right, $64.99) and the fit is always great.